The WineSkin bottle transport bag is the first and only way to safely and securely transport bottles no matter where you go. Never again worry about bottles leaking or breaking inside your luggage or during shipment. Affordable and easy to use. Just place the bottle inside the WineSkin and its double seals help you keep your precious cargo intact. WINESKIN - The original and still the best. Travel with confidence when you choose authentic products from WineSkin, the leader in bottle transport bags. LEAK-RESISTANT - WineSkin is great for luggage since it features WineSkin's classic, brand-name, double-adhesive seal. SECURE - WineSkin will help you get your delicious wines and spirits home safely with their bubble-packaging enclosure for extra cushion, and their tough, thick-grade vinyl exterior. 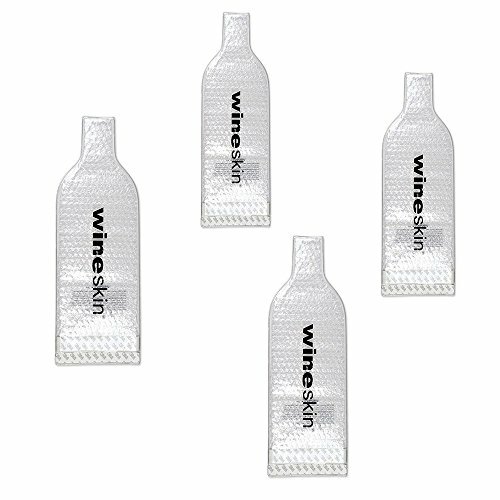 EASY TO USE - Simply insert the bottle into the WineSkin, then peel the inner seal and compress it against the protective outer vinyl covering. Then peel and stick the outer seal and fold the vinyl flap onto the second adhesive strip and press firmly. Each unsealed WineSkin measures 17.75 x 7 x .25 inches. Fits up to 750ml size bottles. If you have any questions about this product by WineSkin, contact us by completing and submitting the form below. If you are looking for a specif part number, please include it with your message.